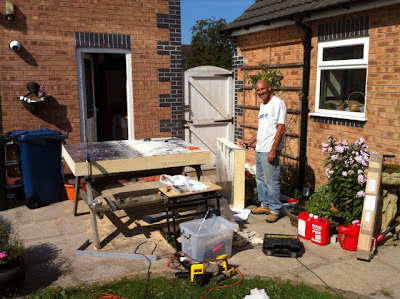 3 Sept 2012: [Extension] A new week and we decided to make a full speed start on the house extension walls. Andy Parker turned up for the day. He is a skilled joiner, and although he hasn't done sandwich panels before, he rapidly got the idea and we worked on the boards I had already cut, and formed all the wall panels for the first 81 centimetres of height. 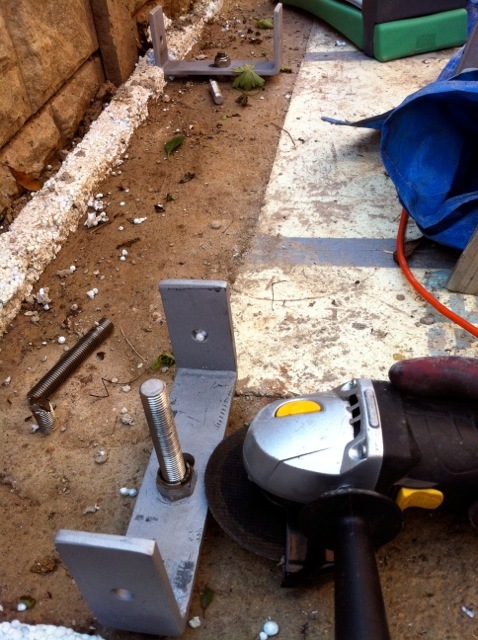 The steel feet have been zinc sprayed, now they have been bolted down and levelled precisely. Now we cut those expensive stainless steel rods down to size with a grinder. 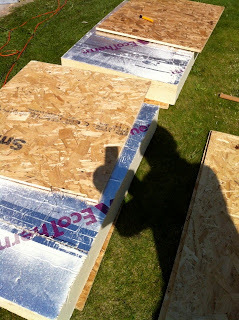 Using the previously cut boards as templates for cutting up the foam layer... the shadowy figure records the process. 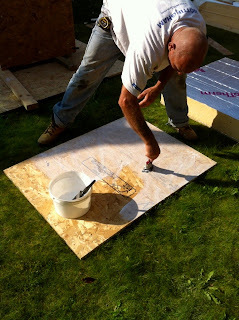 The technical secret! how does one make sandwich panels when we dont have a factory and industrial presses etc? 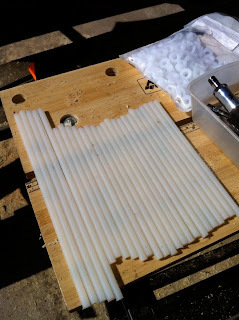 these are NYLON hi-tensile threaded rods that hold the panel layers together. Andy starts gluing the first panel, typical of us to start with the largest and longest one. 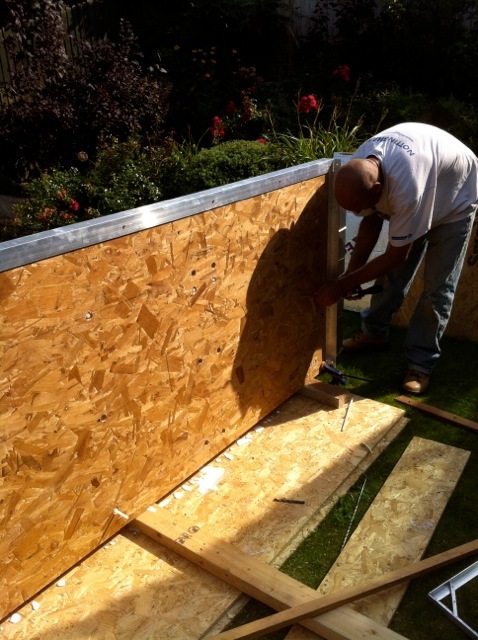 This is the first we have ever done, so every part of the process is carefully planned. 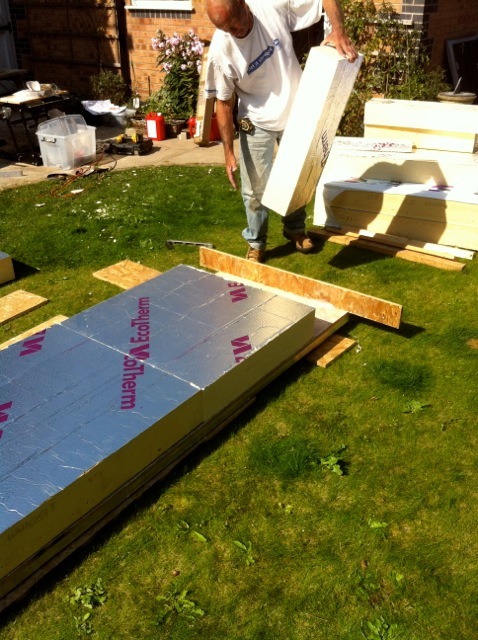 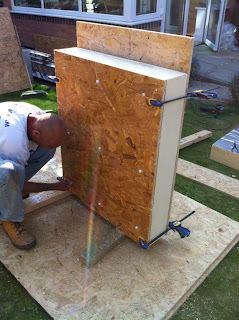 The panels are larger than the slabs of foam, so we have to joint blocks of foam together, and ensure a tight fit. 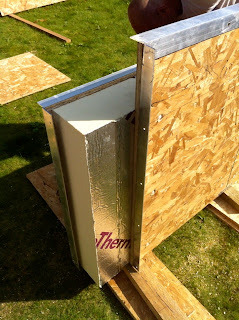 this also reduces waste by using small leftovers. The rods are distributed at all corners and edges and centrelines, and the nuts are countersunk. As the rods arrive one metre long, they are cut to exact length, and if oversize, the waste bits can be easily cut off with a handsaw. 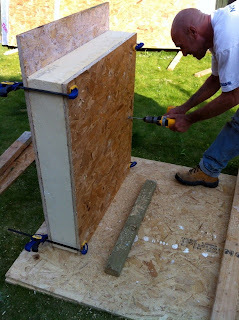 The panel is initially built flat, but as soon as the clamps are on and a few nylon rods installed, the panel can be stood upright for the remaining rods to be be installed and tightened up. The other aspect of the technology is the very careful interleaving of the layers of wood and foam, united by aluminium angles at all junctions. 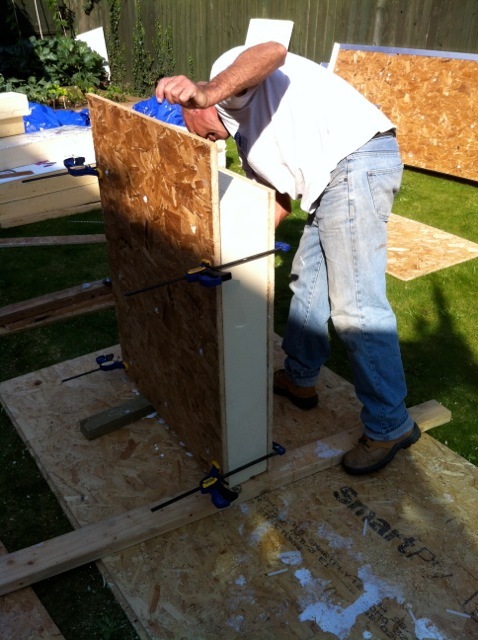 Andy making good progress with one of the small end-wall panels, this is far quicker than the large one, now that we have established 'la methode DNC-oise'. The nylon nuts on the threads are countersunk on both sides, and any sticky outy bits trimmed off later. 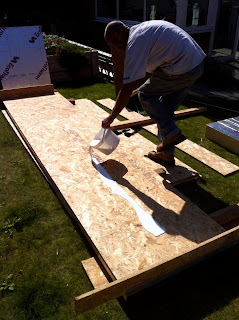 Andy laying glue for the final end panel of the day, using a 1:1 PVA to rainwater mixture. 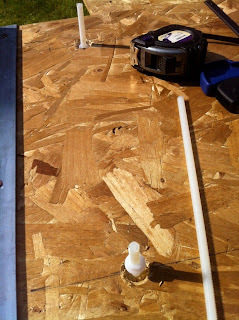 Once the three layers are glued, and held with clamps, we drill pilot holes through to the other side and then the holes are widened with a countersink to receive the nylon nut.